Kwara State Governor, Alhaji Abdulfatah Ahmed has commended the State’s representatives at the 10th Channels International Kids Cup, LGEA Central Primary School, Kaiama for winning the tournament. The Kwara pupils defeated their counterparts from Osun, Baptist Primary School 3-1 in the final match played on Sunday in Lagos. 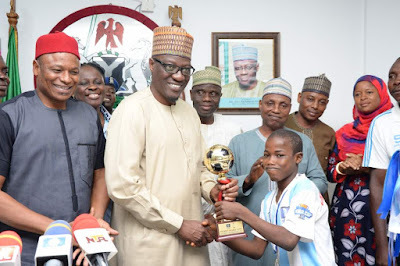 Receiving members of the victorious team at the Government House, Ilorin on Wednesday, Governor Ahmed said he is proud of the team and praised them for being good ambassadors of the state and showing that Kwara is indeed a State of Harmony. The governor noted that football has gone beyond entertainment and a source of physical wellbeing to a means of wealth creation which deserves the support of government, the private sector and the society as a whole. 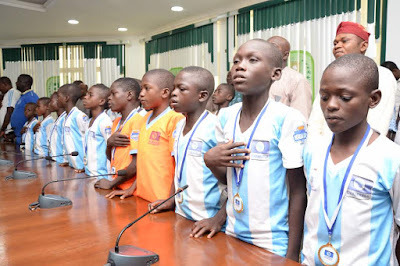 He consequently announced a donation of N2m to the winning team, as part of efforts to encourage their sporting spirit. Ahmed urged the students not allow their passion for sports to wane and promised to strengthen their capacities to attain greater heights. 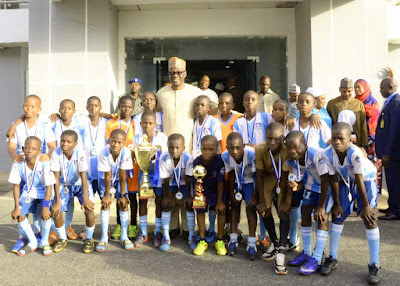 He added that his government would prioritize sports development with the re-introduction of state wide football competition at the Primary school level in order to identify and nurture hidden talents. The governor said the competition will boost his administration’s human capital development and youth development programmes. Mrs Olaide Olanrewaju, the leader of the football team, expressed gratitude to the governor for his unflinching support for sports development in the state and congratulated him on the state’s emergence as first runner up and winner in two consecutive editions of the tournament.